To spoof or not to spoof, that is the question…Spoofing, which sounds more like a 60’s hairstyle than it does a deceptive trading technique, is the rapid placing and cancelling of orders with the intention of skewing actual market depth. It is also one of the charges that a formerly unknown British chap by the name of Navinder Sarao was charged with by the US along with other securities trading related crimes. Nav, as his nickname goes, is also being blamed partially for the May 2010 flash crash. Since 2010 there have been many explanations for the crash ranging from a simple trading error to an algo driven selling frenzy with the truth probably laying somewhere in between. At first, I thought Nav was being scapegoated for our regulators inability to manage markets, but after further review that does not seem to be the case. In fact, having read the actual criminal complaint (see items 15,16 and 17 in the complaint) it appears that Nav may have been a bad boy and could be in some real trouble. The email evidence that the government puts forth, shows Nav developing and using trading software designed to create false market activity. That my friends, is a crime plain and simple. Anyways, it’ll be interesting to see how this case unfolds and if we get our first recorded criminal spoofer. So with our compliance training completed, we can now dive into this weeks economic activity. Things didn’t really get started until Wednesday when we got the National Association of Realtors (NAR) Existing Home Sales data (EHS) and the FHFA Housing Price Index Report . Both prints came in on the high side with the FHFA index showing particular strength. When we look at EHS, it’s very important to look at how it is defined especialy in comparison to new home sales (NHS). EHS captures a sampling of closed transactions drawn from listing services across the country whereas NHS is based on only contracted sales derived from sample surveys. EHS also composes roughly 90% of overall home sales as per NAR. EHS data for March showed unit sales at a 6.1% seasonally adjusted annual pace and up nearly 10.5% year over year. As the graph below shows, we are well below the peak, but the peak is arguably something that should have never been reached if there was any prudence in lending during the housing boom. I think that with today’s rigorous mortage approval process, we are looking at much higher quality sales data. As for the FHFA price index in February, it was up .7% from the prior month, up +5.4% year over year and now sits just 2.9% off its 2007 all time high! Given the low quality transactions that fueled the 2007 peak in prices and the high quality tansactions driving todays prices, we are looking at a healthy housing market. Thursday we got a weekly unemployment claims print that ticked higher by 1,000 to come in at 295,000 with the four week moving average at 284,500. These consistent sub 300,000 weekly prints bode well for the April employment report but then again so should have last months and we saw how that turned out. Of note are continuing claims numbers which continue to grind lower and are at a historically low level. 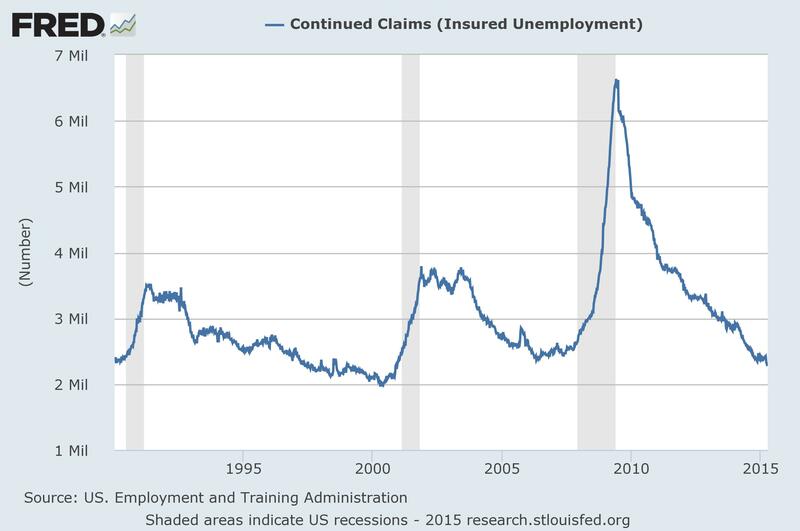 I like to focus on weekly / continuing claims data because unemployment insurance (UI) is a great real time barometer for high turnover trades and services work. With that being said, we still have yet to see the fallout from the energy related layoffs which could show up any week. However, with oil having stabilized around the mid 50’s on the back of Saudi Arabia backing off of its no cuts stance, some oil rig workers may have just gotten new life. I guess only time will tell. Also on Thursday was the Markit Flash Manufacturing PMI for April and new home sales data. The PMI data, which came in below expectations at 54.2, was still well in expansionary (>50) territory but had slowed since last month. The PMI flash reflects the downbeat manufacturing data we have gotten from several readings for March and April thus far. This ties into last weeks closing comments which touched on an economy that, in some sectors, is lacking the enthusiasm we would like to see. 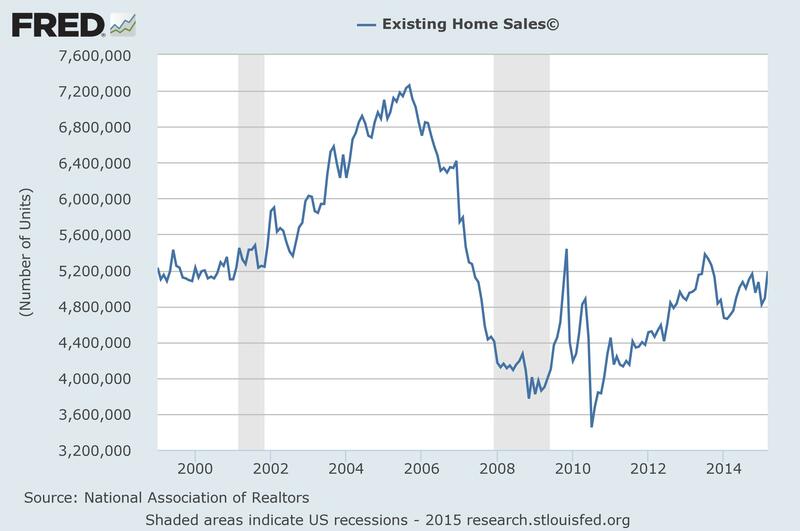 Wrapping up the housing data on Thursday were new home sales, which we had touched on a bit earlier. The print was down 11.4% from February but still up nearly 20% year over year. Last but certainly not least for the week was another soft durable goods report for March. The headline print of +4% month over month was skewed from transportation and defense orders leaving the “core” areas in negative territory. We did see an uptick in the shipments components of the report, which I suspect may be a result of the end of the west coast port strike. It will still take a couple more months of data to get the port strike noise straightened out so we can get some clean readings from many different surveys. Even so, manufacturing data is still persistently lagging other data. Whether the weakness is due to the strong dollar, weak demand or a combination of both remains to be seen. We’ll just have to keep an eye on things and remain data dependent, as the Fed likes to say.